With the inundation of paint-by-number romantic comedies these days, sometimes checking out an ultra low-budget Indie can be a breath of fresh air—even if said movie knows it. 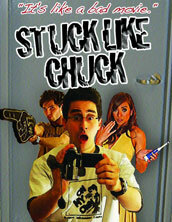 Jerry Cavallaro’s Stuck Like Chuck is a tale of collegiate love and missed signals that can be related to by anyone who’s ever grown up on the fringes of high school popularity. 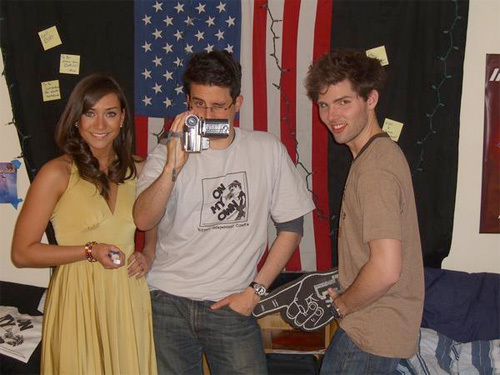 But the story of Charlie’s lust for his film class compatriot Juliet is only the vehicle for the writer/director to poke fun at Hollywood and Indie conventions, while also utilizing the exact things he is ridiculing. There may only be one instance of pure fourth wall breaking right before the title flashes onscreen, yet this entire endeavor breaks convention by wearing its shortcomings on its sleeve, jam-packing as many clichés and stereotypes as it can, ranting about what is right and wrong in cinema, and showing that it’ll do them all anyway. It’s Jerry’s damn movie after all. Charlie is a film genius that seems to know more about the medium than his instructor who would rather play a movie, refer to the book for any answers his students may have questions for, and otherwise do as little as possible. The fact that this teacher is played by Chris Elliott—an actor I’ve never much been a fan of—shows perfect casting since he’s always been the consummate slacker, (and truthfully, the fact he got involved here to help a kid trying to make a name for himself raises the guy up a few notches in my book). Pining over the beautiful Juliet, a girl for whom he moves her seat each day to have a better vantage point of staring at her, Charlie wouldn’t dream of ever asking her out, no matter how obviously interested she is. Only comfortable when in the editing bay and around film, this introverted kid is the king of awkward pauses, a trait that only makes his friendship with loudmouth and obnoxious Rob more believable. Opposites do attract—that goes for friends too—and this coupling is a total send-up of Dante and Randall from Clerks, a film for which Stuck Like Chuck is a blatant homage to. Joe Moran’s Charlie is a bundle of nerves and insecurities, authentic in his shy demeanor and film geekdom, while Patrick McColley’s Rob is a well-meaning prick without boundaries. If the jokes hit, they are mostly from Rob’s mouth, whether an Al Gore climate jab or the humorous acting out of what Juliet would look like conceiving a baby straight through to nursing, you won’t be able to help laughing. Some of the stuff may be crude—Rob’s wall of breasts for instance—but everything stays steeped in a sort of sweet meaning charm, especially the interactions of Charlie and Jocelyn DeBoer’s Juliet. When the two of them are together, you do sense the uncomfortable yearning of wanting to be close. At times you feel it too much as you watch Chuck become completely oblivious to his dream-Tina Fey’s flirting. I wanted to scream “KISS HER! !” numerous times during the film, but while I do believe it slows the pacing down in certain scenes, that dynamic of shy virgin male and former chubby-turned high school aristocracy (‘whore’—her word not mine)-turned abstinent woman trying to find a meaningful connection is necessary to pull this whole thing off. To get beyond the nods to Hollywood’s failures, the obscure cult references like the inclusion of Lloyd Kaufman as a film professor, and the plethora of t-shirts that are actually commenting on the proceeds, (love the ‘Director’s Cameo’), you need to be invested and want these kindred souls to get together. Moran is the kind of guy that encompasses what it is to be on that line between good-looking and too geeky, someone you can see a girl like Juliet falling for with a sense of realism. As for her, DeBoer is not only a very attractive young woman, but she also has the acting chops to pull off the awkward silences you’d expect from Chuck. An extended portion of the movie sees the two locked in their classroom—a ruse hatched by the conniving and amoral mind of Rob—so the performances of these two are crucial. DeBoer overshadows Moran a bit, but then she is also given the meatier role with the ability to use her sexuality; and she does to make Charlie squirm a bit, hopefully breaking him out of his self-imposed shell. It is very talky, putting into practice the love of Kevin Smith that is mentioned throughout, and at times ineffectively so, but the actors are likeable enough to stick with it. Sometimes Cavallaro goes a bit too far in ripping his own industry, especially with a credit sequence joke that may in fact be too on the nose. He is still making a film after all, on some level compromises must be made. Attempting to infuse a Hollywood happy ending as well as the Indie downer of realistic disappointment can appear as a cop-out rather than witty joke, but I understand where he was coming from and I applaud the effort to get as many clichés in as possible—even if I’m a total Indie snob and kind of liked the direction a letdown ending was heading. The sheer fact that he filmed an introduction specifically for the Buffalo Niagara International Film Festival shows the level of passion he has and confidence in his work to continue on towards the planned sequel Stuck Like Chuck Too. Many jokes do hit home and I’d be interested to see where he goes from here. A sequel that takes shots at the same industry sub-standards won’t necessarily make the cut, though, so I hope the plan is to break free from that convention and create a wholly original comedic tale that stands on its own merits. I think he has it in him. Jocelyn DeBoer (Juliet), Joe Moran (Charlie), and Patrick McColley (Rob). Thank you Jared for this well thought out review. I’m glad that you enjoyed my film and I do agree with almost everything you said. Thank you especially for highlighting each of the actors because they had such a large part in making this movie what it is. I was lucky to find actors that really got each character and were willing to take a chance on a 19-year-old film student with no budget. This film is absolutely an homage to Clerks/Kevin Smith, as well as a send-up to indie films in general. I just wanted to make a fun film that didn’t take itself too seriously, which I think is a problem most indie comedies have. As for filming the short intro, it was the least I could do. I love being at festivals and talking with the audience. Since I couldn’t make it to BNFF, I wanted to do something to say thank you to everyone who came out to support the film. Thanks again for your review. Feel free to contact me if you ever want to talk shop. Jerry, Glad you liked the review, I had a great time with it. It’s funny because another person in the audience wrote a short review on IMDB and mentioned how the film teacher was a ‘dead ringer’ for Chris Elliott. It got me thinking, cause I was pretty sure it was him, but no credit on IMDB. Reading your about me page on the film’s site talked about keeping in touch with Elliott after an interview, so I felt confident saying it was him in the review. No one could look and act that much like him and not be the real thing.